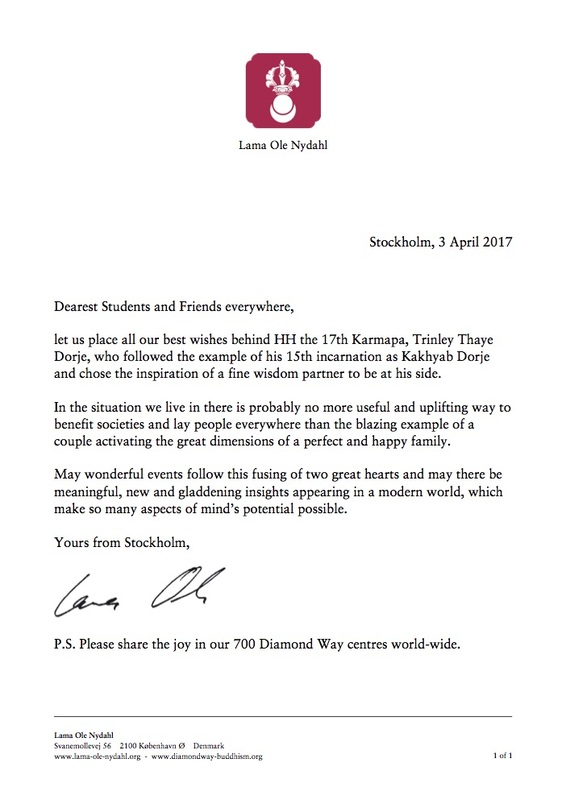 let us place all our best wishes behind HH the 17th Karmapa, Trinley Thaye Dorje, who followed the example of his 15th incarnation as Kakhyab Dorje and chose the inspiration of a fine wisdom partner to be at his side. In the situation we live in there is probably no more useful and uplifting way to benefit societies and lay people everywhere than the blazing example of a couple activating the great dimensions of a perfect and happy family. May wonderful events follow this fusing of two great hearts and may there be meaningful, new and gladdening insights appearing in a modern world, which make so many aspects of mind’s potential possible. P.S. Please share the joy in our 700 Diamond Way centres world-wide.